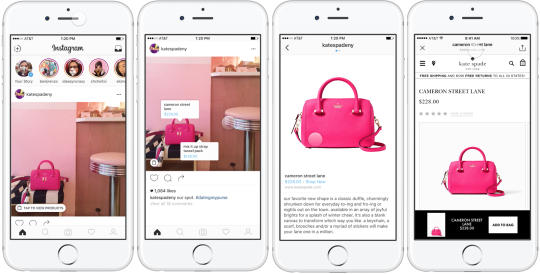 Instagram has rolled out a game-changer for businesses: brands can now sell products directly from the app. The photo-sharing app introduced a new ‘tap to view’ button on November 1, 2016. The button gives shoppers the opportunity to learn more about an item in an image, as well as the option to go directly to the retailer’s website to purchase the item. Instagram chose to add a button that encourages users to learn more first, rather than simply ‘buy now’, because internal research found that only 21 percent of purchases are made within a day. The new ‘tap to view’ option will appear on the bottom left of select Instagram images. The feature is being tested with 20 U.S.-based retail brands, including Kate Spade, JackThreads, and Warby Parker. When users tap on the icon, tags will appear on up to five items within the post, highlighting products and their prices. A new, detailed view of the product will open if users select one of the tags. From there, users can select ‘Shop Now’ to go directly to the product on the business’ website. Instagram’s retail partners expounded on the improved customer experience, which will allow consumers to shop where they are, instead of having their experience interrupted by switching apps. The new ‘tap to view’ option follows on the heels of several other business-related updates. In June, Instagram launched an enhanced call-to-action button, which stretches the full width of the ad, with text appearing on the left-hand side. And that’s not even counting Instagram’s new business profiles, which launched over the summer. One thing is clear—Instagram is courting brands. And with so many business-focused updates, it’s likely to get them. Wondering what social media will look like in 2017? Watch our webinar to learn the trends, tactics, and strategies that will position your organization for success in 2017 and beyond.